Online-based commerce on a variety of internet platforms is increasing. Conditions for shop distributors have changed. The challenges in the processing of data from online shops lie in the mass of the data that needs to be processed and monitored. DATEV has a solution for data transfer from online shops. As a result of the increase in online-based commerce, which is increasingly taking place on a wide variety of Internet platforms, the conditions for shop distributors have changed. 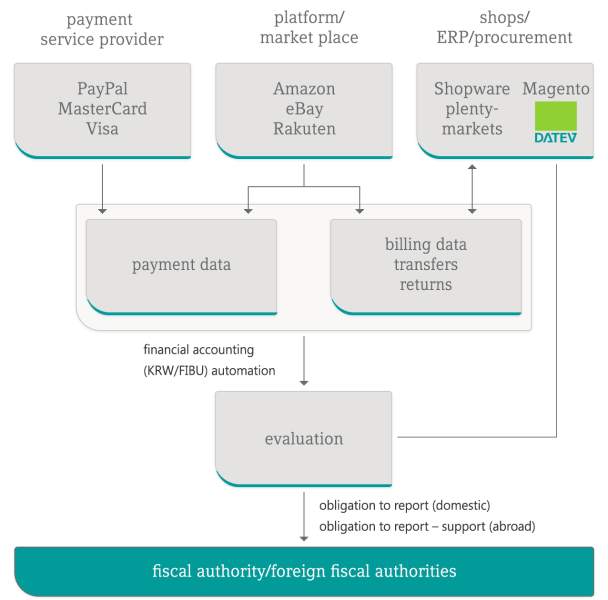 The challenges in the processing of data from online shops lie in the mass of the data, in the automatization of data processing and the monitoring payments and balance of payments, the monitoring of delivery thresholds relating to international sales as well as compliance requirements which need to be fulfilled. For Germany: A correct representation of the complete accounting process with all sales and the related transaction costs and the presentation of intra-community trade under consideration of the delivery thresholds per nation. For foreign countries: The possibility of an easy submission of the VAT by a fiscal representative by taking into account compliance requirements in the country. The invoice data generated for sales is transferred to accounting via an interface in the billing system or with the help of the DATEV Controlling Paket international (DCPi). When transferring data from the transaction lists of the shops and the data from the payment service providers, sales are allocated by country and tax rate at the G/L account level. At the same time, the transaction list data records are separated according to sales (gross amount) and additional costs (shipping, fees), so that an accounting/posting is created for each case. The data from the transaction lists is converted by the use of DCPi. DCPi generates an ASCII processing file for the electronic bank booking which carries out the OPOS clearing. Currently, the delivery threshold has to be checked manually before invoicing. If the corresponding setting has been made, the DCPi is able to post to the accounts before or after the delivery threshold has been reached. It is planned to automate the monitoring of delivery thresholds. We can name fiscal representatives abroad who regulate tax matters (including VAT abroad in accordance with national regulations) for the German tax consultant. For this purpose, the data exports per country are converted to a local system and made available to the fiscal representative abroad for further processing. If your are interested in our offer, please contact us at info@datev.com .